Critical: Back Up Before the 1809 Windows 10 Update! - Ask Leo! The October 2018 Windows 10 Update is apparently deleting some people's files. Here's how to prepare and protect yourself. Several media outlets are reporting that some, though not all, Windows 10 upgrades to the 1809 October update have lost data files in the process. It’s apparently a bug in the update. While it’s unclear how many people are affected, even if it’s just a few, it’s a bad thing. There are steps to take to prevent data loss. Hopefully, you’re already taking them. The update cannot be deferred for Windows 10 Home. Back up everything — most importantly your data — prior to the update. Consider taking the update now, rather than at some random time in the future. 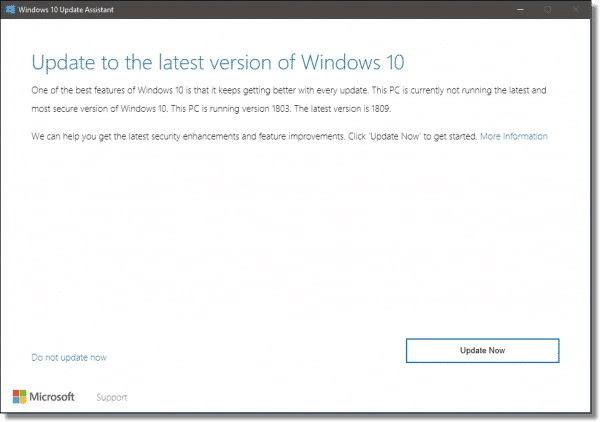 Windows Update continues to push updates to Windows 10 whether you want them or not. This assumes that all updates always work, which clearly remains a bad assumption. Technically, Windows 10 Home edition does not allow you to defer updates. There is, however, an apparently slightly unreliable way to attempt to do so. How Do I Disable Windows Updates in Windows 10 Home? has more. Windows 10 Pro users have the ability to defer major updates, as do business and other large installations of Windows 10. Windows 10 Home users — the vast majority of “average” consumers — do not have a choice. The update will happen when the update happens. The only option is to be prepared. Periodically taking a full image backup of your machine, or setting up those daily backups to do exactly that. Backing up your data files yourself, somehow. This could be copying the files to another location, a thumbdrive, or copying them to cloud storage for off-site backup. Reports seem to indicate that files in the default Documents folder are those at risk. That’s not an assumption I’m comfortable making, however, and I recommend backing up all data files or taking a system image. One of the frustrations is that Microsoft is “rolling out” the update, meaning that not everyone gets it immediately. That puts you in a position of not only not knowing if disaster might strike, but also not knowing when. We can at least fix that last step. Visit the Windows 10 Download page. There you will be given the option to download and install the update immediately. This doesn’t change the risk, and it doesn’t delay anything, but at least it puts the “when” back in your control. It’s frustrating. I really want to trust Windows Update. In fact, the lack of choice you have in the matter makes the assumption that Windows Update is, in fact, trustworthy. While this bug may only affect a small minority of people getting the update, it is what is considered the most severe type of bug: something that actively causes you to lose data. But it also is what it is. You need to take extra care your data is backed up, so if it happens to you, you can recover. Hopefully, you already have a backup strategy in place to do exactly that. If you don’t, you’ll now understand why I so strongly recommend that you do. Sometimes, it’s not the external threats that get you … sometimes, the enemy comes from within. How Do I Clean Up After Windows Update Breaks Other Applications? - Software rot can result in odd behavior, including a Windows update causing other software to fail. Here's one approach to try to get things working again. « Previous post: Why Doesn’t My External Drive Appear When Plugged In? Microsoft hadn’t started pushing the update automatically via Windows Update yet, so only a manual check for updates could have deployed it. It has now been delayed since, as they have removed the update from their site. The deletion supposedly rare also didn’t affect files synced with OneDrive. This registry key would need to be Disabled or set to Not Configured before upgrading to Windows 10 1809. Actually it was getting deployed automatically, as far as I’m aware, just “rolled out” so not everyone was getting it right away. Anyway, as you say, and as I updated, the update has been delayed. I’ve read some rumors that people actually beta tested this update and told Microsoft about this data loss and and they did nothing about it. This is bad. And Apple hasn’t really been a good actor either, as their making it harder or possibly even illegal to get their products repaired with the T2 chip controversy and refurbish/counterfeit confusion. People really need to start making some better brand alignment decisions. I’m not going to argue business needs, but consumers need to stop using excuses like “my games don’t run on Linux”; otherwise if people keep themselves “stuck” with companies like Microsoft and Apple then science fiction of tech giants taking over the world will only become reality. Hi Leo, I am on Win10 Pro and do not yet have 1809. After reading the article I felt compelled to slow down Windows Update to the greatest extent I can. I went to Windows Update Advanced Options and made the apparently unfortunate choice to click and then unclick “Pause Updates.” When I unclicked it Windows printed a message in red type “Updates have been resumed so we are checking for updates to keep your machine current with the latest security and quality updates before you can pause updates again,” and it went and found 1809 and downloaded it! My computer seems to be set now to install 1809 next time I reboot it and there appears to be nothing I can do to stop it. Do you know if there is any way? Thanks! From what I’ve heard, Microsoft has halted the upgrade rollout to 1809 till they fix the bugs. Please see the update(s) at the top of the article. I installed the update on my laptop (Dell 5770) by manually checking for updates. Didn’t lose any data but there are other issues with this update, at least on my machine. Taskbar icons disappearing then reappearing, settings changing after being set are just a couple of the issues. Fortunately I had just finished my daily backup (See, Leo, some of us really do pay attention) and I am back to where I was before. I have Win10 Pro and this latest update won’t be loaded for the next 6 months, unless Microsoft overrides the setting. Protect yourself? For simple stuff (surfing, documents, spreadsheets, Googling) use XP (my preferred OS). Go to Windows 7 (next best alternative). Try Ubuntu. Go to a Mac. I’m sort of running along your stream of thought. Planning on building another machine and running Linux Lite. Works well from previous looksee… and while the interface isn’t exactly eyecandy I’m sure that is able to be changed. Didn’t bother about that during a preliminary looksee. Surfing with XP is risky. There are any unpatched vulnerabilities. Ubuntu or other Linux distros would be safer. I love these types of articles every time Windows 10 updates (yes, every time). My Windows 7 and XP computers work just fine and do everything Windows 10 is purported to do, except WITHOUT crashes, disturbances, changing configurations, file deletions, driver malfunctions, blue screens, forced obsolescence, bricked computers, and spying apps. Yes I know, I’m missing out on all these lovely Windows 10 features. My experience has been that Win10 is absolutely more stable than 7 or XP. Never even looked at 8. And loads faster… but then booting off an SSD instead of platters. Despite my disdain of it when it first came out and played with 10 in shops… now that it is loaded on it is a lot more intuitive than ever before. And… I really should set up a new box as a NAS. I suppose our definitions of “stable” are very different. To me, anything that keeps morphing and malfunctioning, especially when I didn’t ask it to, is not very stable. Amen. As the computer tech of sorts for my immediate family (though 2 of them reside elsewhere) I persuaded them to bypass the Windows 10 (Upgrade?) and keep their Windows 7 operating systems in place. I smile when I read the ongoing troubles with Win10 especially the FORCED updates. Don’t get me started on Win10’s other “personality traits”. But I read the information on Win10 whenever I can because apparently unless I’m willing to learn Linux (which is looking more likely), then I’ll end up purchasing a Win10 computer at some point. Ugh!! Well today is not that day and by the way, I keep all of the family’s computers backed up & have full system images of each of them so we’ll be good for some time to come. Double Amen. Unless someone wants to use an application that won’t run on anything other than Windows 10, there is no good reason to go to Windows 10. Even then, there are always alternatives. The often cited issue of “security” for updates is a red herring. For many years MS has been calling most of it’s patches “security update” (thousands of them). If you take the time to dig through the details of some particular update you’ll see it often has nothing to do with security. On the other hand, if MS comes up with a security update for protecting against Windows updates, I’ll install it. Leo, sorry for all this cynicism, but you have to admit that it’s well deserved (by MS). However, your informative articles are much appreciated. Thanks. Actually, using an unpatched version does put your computer at risk. My Dropbox files were deleted. I managed to recover them from the Dropbox site. I am not commenting on this issue, I was just intrigued to see a comment from Mike Cutmore who shares my surname. It is an unusual surname and I have seldom come across others who share it with me. So, Hi Mike, from John Cutmore in South Africa. This is why I stopped using Windows a long time ago.